As I boarded a plane bound for Haiti in December 2010, I received a text from one of my research assistants that says that Voila had just launched its mobile money service, T-Cash. It was followed closely by Digicel’s TchoTcho mobile. 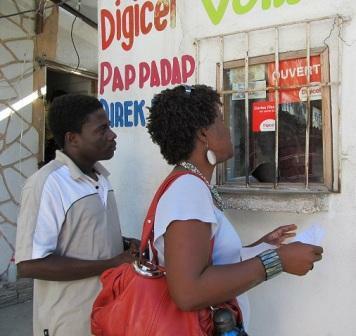 The advent of mobile money in Haiti is interesting and exciting. As an anthropologist I was curious to see how this new technology was going to change internal migration and remittance patterns between Port-au-Prince and the provinces. My interest in mobile money is also personal. As a Haitian with friends and relatives living in different parts of the country, the prospect of sending money electronically is particularly welcome. With mobile money I no longer have to rely on expensive money transfer services, bus drivers who offer remittance services, or send money with friends and relatives who are travelling back to their home towns. Once in Haiti, I set out to register for both services. Registering for Voila’s T-Cash required sending a text to their dedicated number using your Voila phone. Within a few minutes you receive the secret pin required for withdrawal and transfers. Digicel’s TchoTcho Mobile is a little more bureaucratic as it requires in-person registration with a valid state-issued ID and a photocopy of said ID. As with any new service, there were some kinks that both companies needed to work out. Although both companies boast agents throughout the country, or Port-au-Prince in the case of Digicel, finding an agent is not always easy. On the day I registered for TchoTcho, I had to visit four agencies. At the first store we were told that the agent had been called away elsewhere; the second agency did not have an internet signal, while the third had sent their laptop out for repair. However, six weeks on, it is easy to find functioning TchoTcho agencies, even though Digicel has not officially launched their service and are not advertising. T-Cash is another story: while we have found numerous businesses with the T-Cash sign on the front of their shop, few of them are actually operational. 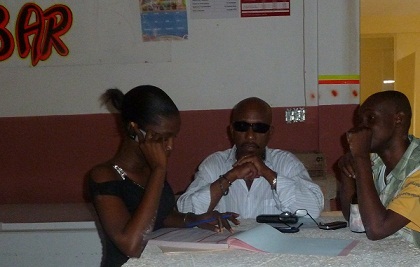 Safety issues are one of the main attractions to mobile money in Haiti. Discussing the risk of being mugged, Max, a plumber and TchoTcho customer, told me that an advantage of mobile money is that you can deposit your salary at an agent near your job and withdraw it at an agent in your neighborhood. Not only do you not run the risk of your money being taken away from you as you travel from your job but you do not have the stress of travelling with money. Max went on to say that he likes the fact that TchoTcho agents are located in regular businesses. If he walks out of a restaurant or a clothing store, no one will know that he just withdrew money. Whether to keep the conversation going with your girl, transporting your salary across town, hiding money from yourself or sending money to your ninety-year-old aunt in Carrefour George, mobile money is definitely a welcome addition to the financial landscape in Haiti. --Photo #1: Espy topping up mobile money. Photo credit: Erin B. Taylor, 2011. Will mobile money really bank the unbanked?